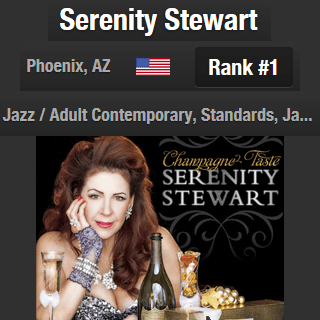 The recent release of Champagne Taste has propelled Serenity Stewart to the top of the jazz genre in Phoenix on ReverbNation. Make sure to visit her page on ReverbNation where you can listen to the new songs and share your favorites on Facebook and Twitter. If you haven’t already purchased your copy of Champagne Taste, get it now in the iTunes store.